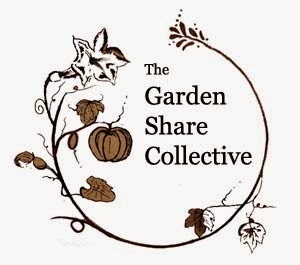 Linking up with Lizzie at Strayed from the Table for another round of Garden Share Collective. Sadly, not a lot has changed in my veggie patch since last month, it has been badly neglected and pretty much left to its own devices. Despite the neglect things are still growing. I planted silverbeet in a few gardens and it is all doing well. Silverbeet growing amongst the weeds that are threatening to take over the veggie patch. The rhubarb is still growing strong, I will be harvesting this sometime in the coming week and it will be going into the freezer for later use. The pumpkins are looking a bit tired now, but I am hoping they will continue to grow long enough for the two smaller pumpkins on the vine to ripen. We are expecting our first frost on Thursday, so I will have to remember to cover it. The only cucumber to survive the summer has finally set fruit, will it reach maturity, I hope so. If you look closely you will see a smaller cucumber sheltering underneath the leaves. What I think will be the last of the basil, but it was a very good harvest. I will be freezing the majority of it to use over the cooler months. Celery seeds, I have been unable to find this in the shops, so I decided to grow my own. Garlic, 60 cloves all together, 36 white, 24 purple. Get some peas sown ASAP. Buy more seedlings of broccoli, cauliflower and Asian greens.